Nomads love felt. Traditionally felt is made by hand and used to cover the yurt. It is made into beautiful rugs by Kyrgyz people and finds its way into hats and slippers. 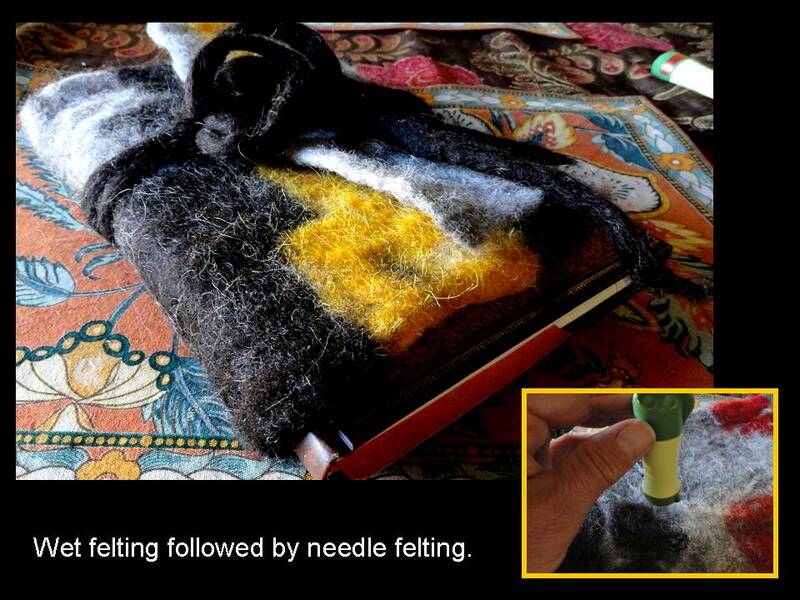 Felt is made by massaging wet wool into matted forms. Small scales like those on a fish along each wool fiber expand open when wet and heated, then close again, thereby trapping fibers together. Felt fits the nomadic lifestyle by being lightweight, strong, insulating, renewable, versatile, and beautiful. 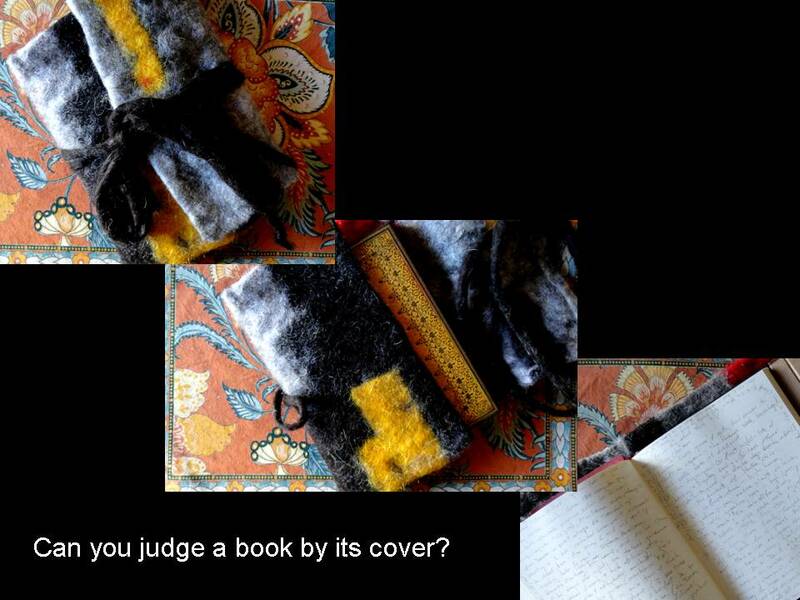 My experiments with felt integrate travel, craft, art, and the sharing of ideas into a physical legacy of the experience. Anthropologists’ treatments of nomadic fiber art seem to miss the memories, connections, and narratives nomads develop while providing objects of comfort and shelter. By gathering materials in one place, producing in another, and using felt over time, nomads carry knowledge of good sources of materials and of helpful relationships throughout their domain. Styles and color schemes become parts of tribal identity, symbolic shorthand for who we are, where we live, what we value, what we know. Fiber art satisfies the requirement to minimize baggage by concentrating art on indispensable clothing and shelter rather than relegating it to additional decorative objects. 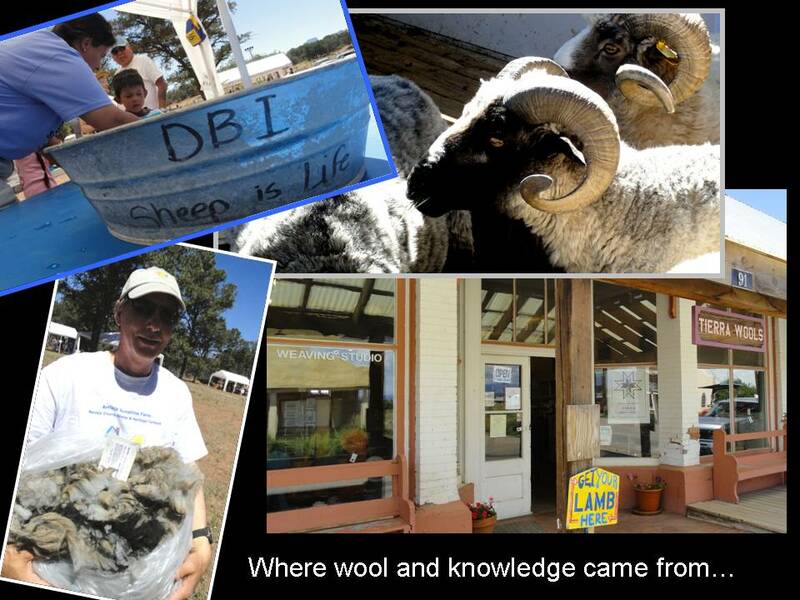 In June 2011, I traveled with my class through the New Mexico and Arizona foodsheds. In Tsaile, Arizona, on the north rim of Canyon de Chelly, we attended the Sheep is Life festival held on the grounds of Diné College. Seen from above, the striking sacred geometry of the college encompasses a 2000 foot diameter circle with clusters of buildings oriented on the cardinal directions, a motif shared by hogans and yurts. The public day of the festival included samples of traditional Navajo tea and booths to buy weavings, yarn, and wool. A traditional Navajo weaver held up a vivid blanket and declared, “This came from my corral.” The felt-making workshop struck a chord and soon I was learning how to make simple felt by a wet process involving window screen, dish soap, water, and lots of rubbing. The potential for making nomadic clothing and decorations was irresistible. For $11 I bought a complete raw fleece smelling of lanolin and containing mysterious bits of barnyard detritus, all fresh off one particular Churro sheep named Daffodil. Good ideas spread fast. As Foodshed Nomad, I held a mini-workshop about making felt on my trip to Los Poblanos Inn and Cultural Center in August. 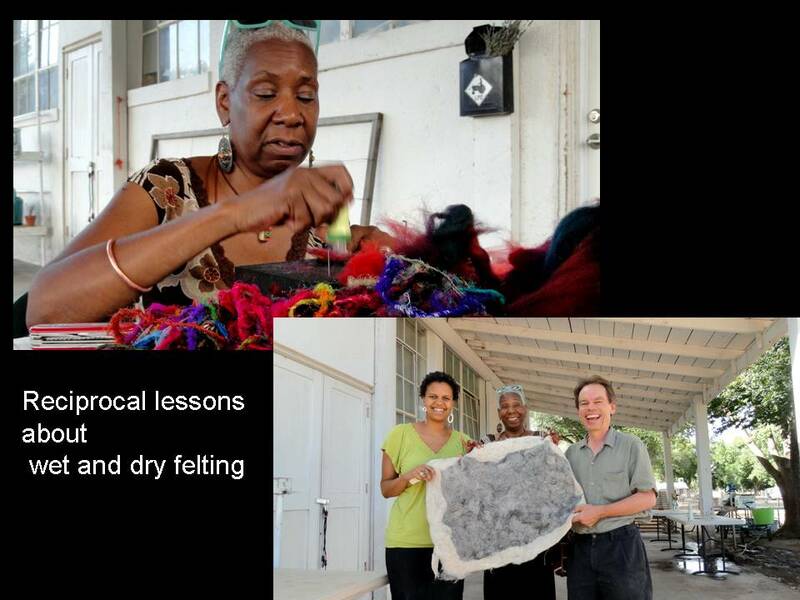 There, I met Binah, master fiber artist who specializes in a dry felting process that requires special needles. Dry felting may be the savior of wet felting because small glitches can be healed and finishing touches can be put on edges of the fabric with the needle method. The felt book cover sports the gray color of Daffodil and vivid colors of Churro wool from Tierra Wools in Los Ojos, New Mexico. The bold palate included dyed roving in golden yellow and orangey red, along with natural chocolate brown. As a relatively new tribe of one, I wonder how other tribes lodge on particular color schemes and how designs of hats, robes, and rugs are settled upon by the community, ultimately becoming iconic of that group alone. Contingency plays a role — a finite selection of colors in the local fibershed limits the scope of possibilities. Once a satisfactory pallet is selected, it may become adopted as the local standard. Imagine the creative energy of contemporary communities inventing a localized couture. Following a design in Liz Clay’s creative book Nuno Felt, I made the book cover from four pre-fleeces of solid color that were stacked like pancakes. I cut out shapes, or plugs, through all layers at once, which enabled plugs to be inserted into the corresponding hole of a differently colored background felt. The ensemble was carefully wet felted again to lock the plugs into the background. Upon drying some wools shrank more than others leaving small gaps that I filled in by needle felting. The cover now protects my journal like a favorite sweater. Judge this book by its cover, a direct outcome of inquiry into the nature of nomadic ecology. This enfolding of experience, where the chronicle is wrapped in fibers and knowledge met along the journey, is magical where consumerism is not. In an essay in the 1976 book Radical Agriculture, Wendell Berry tells how agriculture needs ecology as its fundamental science and ecology needs art to express relationships. The Foodshed Nomad’s art depends on relationships that span place, time, and culture. The underlying ecology ramifies from fleece to flock, to field to landscape and watershed through time – seasons, generations, and centuries. The cultural aspect of agriculture involves tacit union of the Spaniard’s gift of Churro sheep to the New World, the Navajo lessons of Spider Woman, and the descendant of European immigrants’ active quest for connection to place. To touch the book cover is to invoke these many dimensions of existence and to validate the beings, human and otherwise, which made it possible. This entry was posted in Uncategorized by Foodshed Nomad. Bookmark the permalink.